British Automotive’s redesigned rear upper shock absorber mounting bracket kit is suitable for your SPAX (SPG824) telescopic shock absorber kit. While these shocks are fitted with integral bump stops, it is advisable that the OEM rubber bump stop be retained and active under full bump conditions. A new upper shock absorber mounting pin position with a maximum offset of 3.1/4" upwards which, depending upon your vehicle's rear suspension ride height, may not require the change over of the OEM shock absorber lower link mounting plates from side to side. Multi mounting holes that allows for simple installed height adjustment increments of approximately 1". Allows for a more efficient shock absorber working angle. Various shock absorber kits that are available have shock absorber angles of between 20 and 25 degrees, this new upper bracket, depending on the mounting holes used, will reduce this to between 5 and 8 degrees. 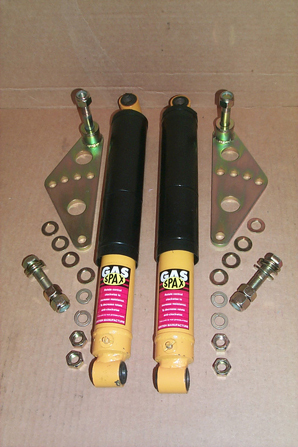 Since, the working angle of the shock absorber will vary with it's installed height, the installer should be aware of any shock absorber body interference with the rigid brake lines that run along the axle tubing. If there is any interference, simply bend the offending brake line to clear the shock absorber body. (1)…. Measure the distance from the upper bracket shock absorber mounting stud to the center of the OEM shock absorber link mounting plate hole. (2)… Rotate the adjustable upper bracket to the ideal fitted length of 16” or as near as possible to this length as in (1) above. Hopefully, the amount of distance in (1) would be slightly less than 3.0”. Normally, we would like to see 2.5”, therefore allowing ½” of bump stop compression. If this measurement is abnormally low, your rear ride height is probably low also. Since, your Spax shock as a built-in bump stop, you could remove the OEM bump stop rubber. However, this is not advisable. Look at reestablishing your ride height with the fitting on new road springs, or simply have your original springs re-arched. NOTE: For ride and comfort, your shock absorbers have been set on the softest setting.